Nobesit 500: Each tablet contains Metformin Hydrochloride BP 500 mg.
Nobesit 850: Each tablet contains Metformin Hydrochloride BP 850 mg.
Nobesit XR 500 : Each extended release tablet contains Metformin Hydrochloride BP 500 mg.
Nobesit XR 1 : Each extended release tablet contains Metformin Hydrochloride BP 1 gm. 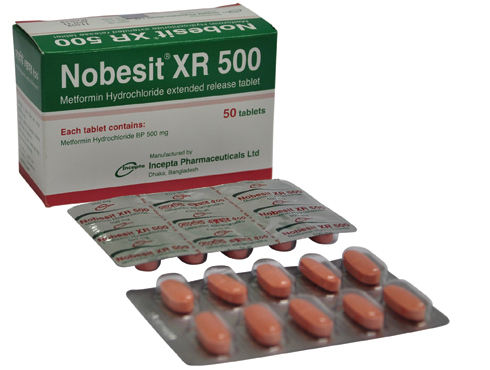 Nobesit is a biguanide type oral antihyperglycemic drug used in the management of type 2 diabetes. It lowers both basal and postprandial plasma glucose. Its mechanism of action is different from those of sulfonylureas and it does not produce hypoglycemia. Nobesit decreases hepatic glucose production, decreases intestinal absorption of glucose and improves insulin sensitivity by an increase in peripheral glucose uptake and utilization. Nobesit, as monotherapy, is indicated as an adjunct to diet and exercise to improve glycemic control in patients with type 2 diabetes. Nobesit is also indicated for use in combination therapy with an oral hypoglycemic agent or insulin when diet and exercise plus the single agent do not result in adequate glycemic control. Dosage of Nobesit or Nobesit XR must be individualized on the basis of both effectiveness and tolerance, while not exceeding the maximum recommended daily doses. 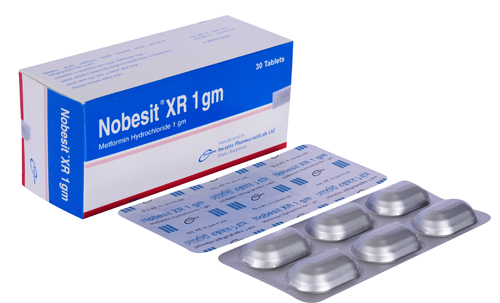 The maximum recommended daily dose of Nobesit is 2550 mg in adults and 2000 mg in pediatric patients (10-16 years of age); the maximum recommended daily dose of Nobesit XR in adults is 2000 mg. 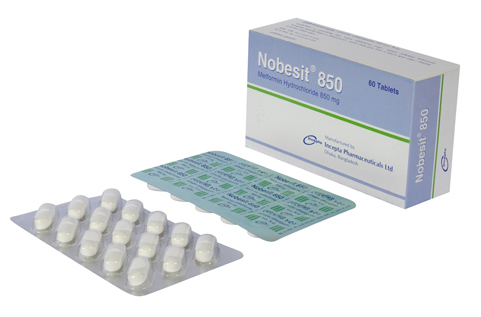 The usual starting dose of Nobesit is 500 mg twice a day or 850 mg once a day, given with meals. Dosage increases should be made in increments of 500 mg weekly or 850 mg every 2 weeks, up to a total of 2000 mg per day, given in divided doses. For those patients requiring additional glycemic control, Nobesit may be given to a maximum daily dose of 2550 mg per day. Doses above 2000 mg may be better tolerated given three times a day with meals. The usual starting dose of Nobesit XR is 500 mg once daily with the meal. Dosage increases should be made in increments of 500 mg weekly, up to a maximum of 2000 mg once daily with the meal. For those patients requiring additional glycaemic control, a trial of Nobesit XR 1000 mg twice daily should be considered. 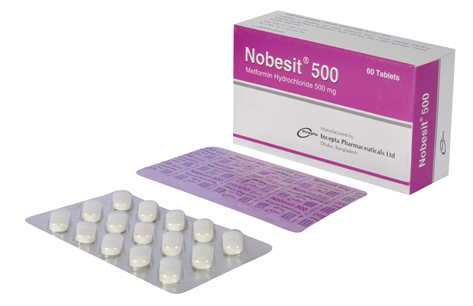 The usual starting dose of Nobesit is 500 mg twice a day, given with meals. Dosage increases should be made in increments of 500 mg weekly up to a maximum of 2000 mg per day, given in divided doses. Safety and effectiveness of Nobesit XR in pediatric patients have not been established. Nobesit XR tablets must be swallowed whole and never crushed or chewed. Gastrointestinal symptoms (30% patients) such as diarrhea, nausea, vomiting, abdominal bloating, flatulence and anorexia are the most common reactions to Metformin. These symptoms are generally transient and resolve spontaneously during continued treatment. Because gastrointestinal symptoms during therapy initiation appear to be dose-related, they may be decreased by gradual dose escalation and by having patients taken Metformin with meals. Rarely lactic acidosis (approximately 0.03 cases/1000 patient-year) can occur due to Metformin accumulation during treatment with Metformin. Metformin is known to be substantially excreted by the kidney and the risk of Metformin accumulation and lactic acidosis increases with the degree of impairment of renal function. Thus, patients with serum creatinine levels above the upper limit of normal for their age should not receive Metformin. Pregnancy: Safety in pregnant woman has not been established. Metformin should be used during pregnancy only if the potential benefit justifies the potential risk to the fetus. Nursing Mother: It is not known whether Metformin is secreted in human milk. Because many drugs are excreted in human milk, it should not be administered to a breast feeding woman.